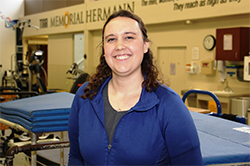 For Houston-based occupational therapist Katie Nedley, a dedication to her patients at TIRR Memorial Hermann rehabilitation hospital, in the Texas Medical Center, meant working overnight during the worst of the city’s recent flooding. An Omaha native, Nedley has lived in Texas for nearly five years. Her team at TIRR Memorial Hermann primarily works with patients who have sustained traumatic brain or spinal cord injuries or have had limbs amputated.As rain started falling on Houston, and flooding intensified, the hospital began lining up staff members who could still travel to work. Nedley lives one mile from the hospital but still experienced some difficulties making it through flooded streets and fast-moving water. “I was holed up in my apartment, trying to figure out what was going to happen next, also knowing that the hospital needed staff to relieve others who had been there overnight,” she said. When the waters receded, Nedley went to the hospital, prepared to stay for a few days in case the rains started again. After a full day of work with many patients, she curled up in a dark office to get some rest. Instead of working one on one with her regular patients as normal, during the height of the storm she and other therapists were assigned to floors of the hospital.“We wanted our patients to remain as active as possible while we were riding out the worst of the storm,” she says.While Nedley only had to spend one night at TIRR Memorial Hermann, she was prepared to go the extra mile for her patients. After learning of the devastation that hit Houston after Hurricane Harvey, Marco Martino knew he had to go the extra mile to help. He learned of volunteer opportunities in Texas through the American Society of Health System Pharmacists, and quickly signed up to assist. 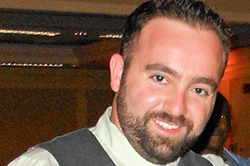 Martino, who is an outpatient oncology pharmacist at Chicago’s Northwestern Memorial Hospital, also had to apply for a temporary pharmacy license to practice in Texas, a process that was expedited for volunteers after the natural disaster. A day after receiving that license, Martino took a flight to Houston, where he spent a jam-packed 24 hours working at the NRG Center, which served as a temporary shelter during the aftermath of severe flooding in the city. He arrived two weeks after the storm hit. By that point, he said, individuals in the shelter were starting to run out of medications. So the team of physicians, pharmacists and nurses worked quickly to provide medical care and fill prescriptions on a short-term basis. Martino said he also passed out a wide variety of over-the-counter medications. He also assisted with a patient who had a drug overdose. “I was amazed at the variety of services that were offered in the NRG Center,” Martino said. “It was like a little city; there were AA meetings, prayer services and even a barber shop.” The nearly 2,000 individuals who were staying at the shelter also had access to lawyers, government officials and nonprofit organizations. One thing he took away from the experience was the reminder that natural disasters “don’t discriminate,” in who they affect, he said. “It was very humbling.” Martino said he would definitely volunteer in a situation like this again, and encourages other health care providers to do the same. This fall, Sven Normann, BSPha’78, PharmD, spent 17 days in Puerto Rico, where he assisted with medical services in the aftermath of Hurricane Maria, which caused catastrophic damage to the U.S. territory. But while he was en route, he discovered he was in the company of another Creighton graduate: Daniel Pojar, BSEMS’10. “It was really cool to know we were both Bluejays,” Normann said. Normann’s interest in disaster-relief efforts ties back to a long pharmacy career with various poison control centers and teaching a disaster planning and response course as a faculty member at the University of Florida. He currently lives in Gainesville, Florida. He traveled to Puerto Rico with National Disaster Medical Systems, a federal government agency that mobilizes health care professionals – such as physicians, pharmacists, nurses, physician assistants and paramedics – in the wake of disasters to help fill care gaps. He joined the group several years ago and is currently a member of the Florida 6 DMAT (Disaster Medical Assistance Team).